Despite the snow, we’ve seen signs of spring around Algiere’s, and the sprouting of snowdrops and trilling of robins outside our windows make us think of one thing. Mulch. Mulch is vital to a healthy bed, because it keeps the weeds out and can also help with water retention and keeping roots cool. Wood, shell, stone, no matter what kind of mulch you choose to use, it’s important to purchase pretreated materials. You may save money up front by getting something from the dump or shredding your own wood, but in the long run you’re more at risk for pest infestation. The varieties of wood mulch available ensure you’re doing the best for your garden while still being able to put on your own unique touch. Double shredded pine, cedar, or even cocoa shell, which can offer a nice aromatic for small beds around the house. 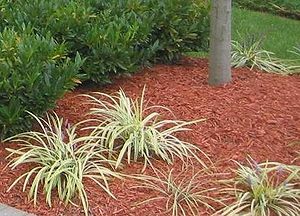 Choose a dyed mulch to maintain color longer for a more uniform look. Whatever your mulching needs, we at Algiere’s can help! Call or email now for best availability. This entry was posted in Uncategorized and tagged Garden, Home, landscaping, mulch, Plant, seashells, Soil, Soil and Additives, stone, Weed, Wood on March 12, 2013 by mspetersonexplains.